Online delivery platform Just Eat (JE.) has been a superstar since joining the stock market in 2014. The value of its business has grown so much that it will join the FTSE 100 index on 18 December, putting the stock alongside some of the world’s biggest and best known companies. This feat is quite remarkable when you consider its business merely facilitates the ordering of takeaway food via your computer, tablet or mobile phone. It has minimal tangible assets apart from cash and doesn’t even pay a dividend. Does that sound like a FTSE 100 company to you? 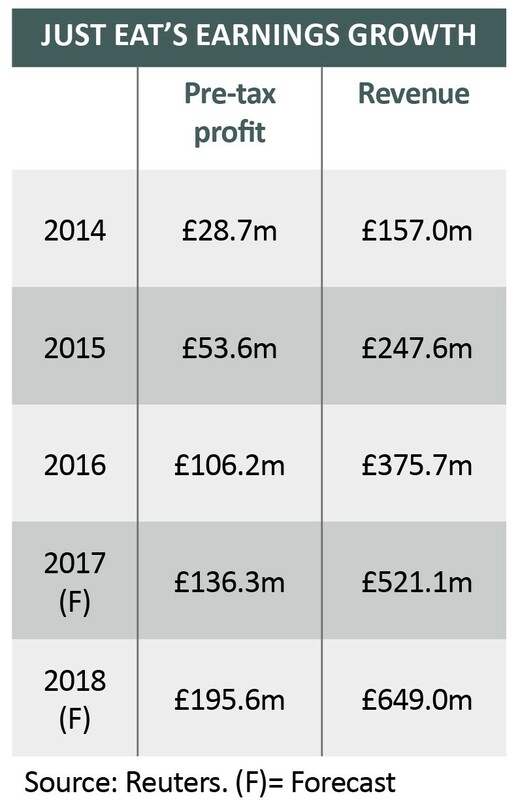 There’s no denying its success with earnings having soared over the past few years such as 164% pre-tax profit growth in 2016 to £91.3m. 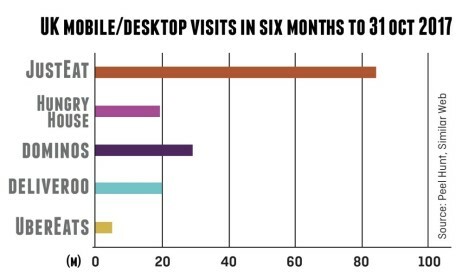 Take a closer look and you’ll realise this is not simply a fad business. In fact, we think it still has significant potential to grow earnings by being more sophisticated in how it operates. When the company first floated on the stock market, it charged restaurants 12% commission for orders placed via its platform. Since then, Just Eat has been able to been able to hike commission rates to 13% for existing restaurant clients and 14% for new ones. The online ordering platform is taking advantage of a global love of takeaway food as it is currently dominating the competition in some of its operating regions including the UK and Canada. According to Just Eat, it targeted a total addressable market worth £23.1bn last year, and holds a strong position in the UK, the largest single market worth approximately £6.1bn. Despite high inflation squeezing disposable income, UK consumers are still indulging in takeaway food as online ordering has grown faster than gross domestic product. The company says strong order growth has been driven by its platform’s ease of use, the range of food available, as well as the desire for restaurants to connect with customers via digital channels. Over the last few years, the takeaway space has become increasingly crowded with competitors such as Deliveroo and Uber Eats, yet these have so far failed to stop Just Eat’s strong momentum. One of the key advantages for Just Eat is its low overheads since it does not hire any drivers to deliver food. By getting restaurants to deliver the food, Just Eat also avoids legal battles that its rivals have experienced. One of the biggest public spats this year has been Deliveroo couriers trying to gain basic rights, including a minimum wage, which could have hiked costs if they succeeded in court. 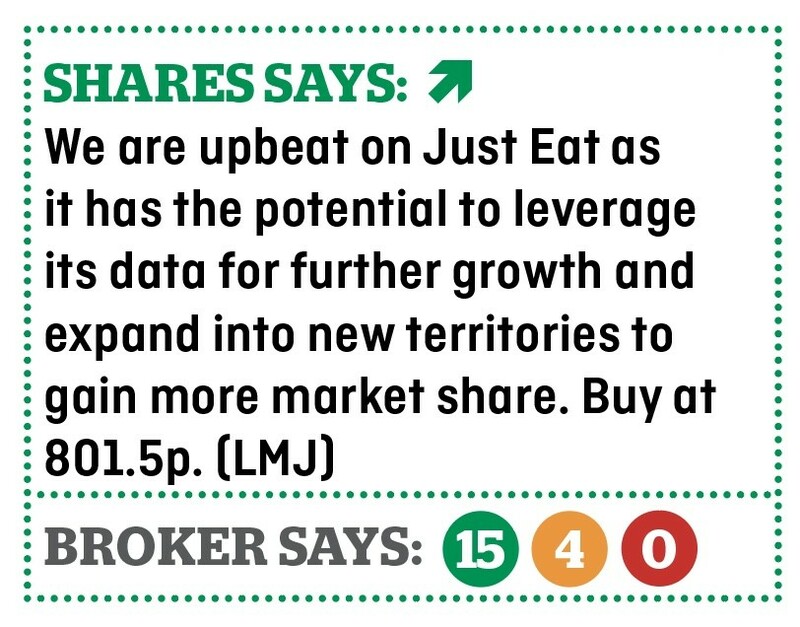 One of the key concerns surrounding Just Eat has been its high valuation. The company currently trades on a forecast 32.9 times earnings per share in the year to 31 December, which is a high rating. Investors should note that companies with rapid revenue growth can command high valuations, hence why we aren’t overly worried about Just Eat’s current rating. Peel Hunt analyst James Lockyer highlights the company is cheap on certain metrics. For example, the stock trades on a mere 0.8 times price to earnings to growth (PEG) ratio; a figure below 1.0 is generally considered good value. While people are ordering more food online, the company has also grown through acquisitions. For example, last year it bought Canada’s largest online food delivery marketplace SkipTheDishes for $110m. Just Eat’s international orders increased by 43% to £16.9m in the three months to 30 September, which was helped by triple digit pro-forma order growth from SkipTheDishes. 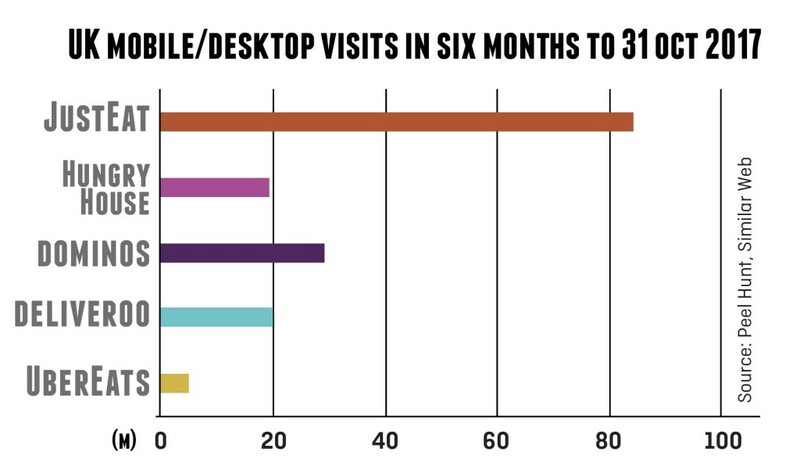 Just Eat is also gobbling up competition in the UK. In November, the company received the green light from the Competition and Markets Authority for the takeover of its closest UK competitor Hungryhouse. The deal is expected to complete by 31 January 2018. Investec analyst David Amiras is confident the deal will boost earnings before interest, tax, depreciation and amortisation (EBITDA) by 7% next year, with an expected EBITDA contribution of £15m from Hungryhouse. 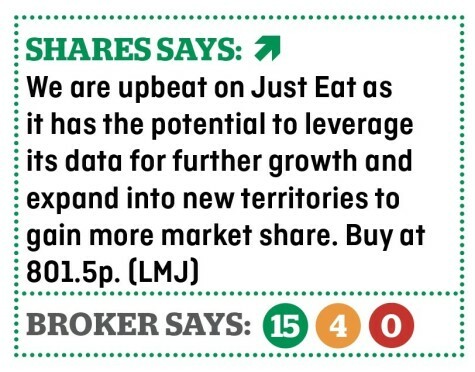 Just Eat also uses its significant data insight to boost profitability. It has a database of information from 71,000 restaurant customers it can use to help businesses earn more, cut costs and hike prices. Peel Hunt claims that Just Eat could identify the average price of specific dishes in a certain area and optimise a restaurant’s menu by dropping the least popular dishes to reduce costs and wastage. This could also allow restaurants to push up prices for the most popular items, meaning they can afford the additional money for Just Eat’s data analysis service.